Consistent, predictable results from every engine wash can help to significantly reduce aircraft engine fuel burn – typically in the range 1 to 1.5% per annum. For fleets of hundreds of aircraft, this can translate to millions of dollars saved. Shorter cleaning cycles mean less down time. Ro-Jet-Wash™ can be deployed at the gate, or even on the taxi-way in emergency situations, bringing down critical heat buildup to acceptable levels, allowing for fewer engine-related delays. “Exhaust gas temperature margin (EGTM) recovery when washing with the Rochem® Jet Engine Wash System has averaged over 10 deg. C for our fleet of CFM56-5 engines installed on Airbus A319/320/321 aircraft. This level of recovery has exceeded the last decade of experience we’ve had with legacy equipment. 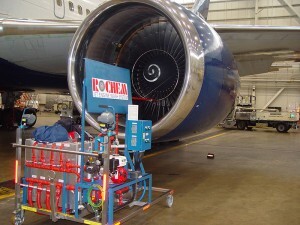 . . With the Rochem® Jet Engine Wash System, we can now measure that sustained recovery in months and retain the benefits of reduced fuel consumption for months.​"
Patented atomizing nozzle injection system maximizes cleaning result with no consumables apart from hot water (minimal detergent chemical addition furthers improve cleaning effect). Optional mobile sluice and post treatment system improve environmental sustainability. The optional demineralizer system generates high quality wash water meeting all engine OEM requirements. The combination of improved fuel efficiency and sustained power output, decreased cleaning times, and engine wash costs in the tens, not thousands, of dollars (compared to high cost engine-wash service contracts) grants the Rochem® Jet Engine Wash System a short amortization period, and it will pay for itself many times over. Ro-Jet-Wash™ boasts a self-positioning system – no physical connection to the engine being washed. The entire self-contained system can be positioned and managed by a minimal crew.